My New Year's "aspiration" was to be creative. I wanted to make things for my friends and be crafty in general. It has been more complicated than I thought and I am having trouble finding time to do crafts. Nevertheless, I am having a party this week for my birthday and I decided to be super crafty and make some fabulous invitations. I wanted to make invitations that people would not want to throw away, and I think I achieved that. My party is out in the country where there is a creek and you are surrounded by nature. So, I wanted my invitations to reflect that atmosphere. The majority of the things I used to make my invitations were rubber stamps. The invitation: The background is water made with a stamp using blue ink symbolizing the creek. I stamped a pier in brown ink over the water. I got a sheet of white paper and stamped butterflies all over the page. I colored the butterflies and then cut them out. Tabs are very helpful when you wantsomething to stand off the page. They are little sticky squares that you put underneath something. I used tabs with the butterflies and with the squares of paper. You may be wondering how I did the squares of paper because it does look confusing. First, I cut out a bigger piece of textured green paper. Remember to always use a measuring tool, because I could not have done the invitation without one. After the textured paper, I cut some patterned ribbon and glued it around the invitation. Next, I cut out some light green paper and grass paper, each different sizes with the grass paper being the smallest. I glued the grass paper on top of the light green and put tabs underneath them. I stuck the layered paper to the textured paper. 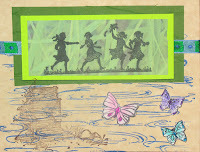 Finally, I used a stamp of little girls running on top of the grass paper and voila! You have the cover of your invitation. On the inside I used a stamp that said For, Date, Time, Place, and RSVP. I glued a sheer silk green leaf on top. Wow! They were pretty, but being crafty does require patience!